(Fort Wayne, IN) – Opening July 11th, the Fort Wayne Museum of Art will host Invisible College, a group exhibition co-curated by Andrew and Shawn Hosner of Los Angeles’ Thinkspace Gallery, and Josef Zimmerman of the Fort Wayne Museum of Art. On view until September 27th, the exhibition will feature new and representative works by 46 artists belonging to the New Contemporary movement. Dedicated to the energy and strength of its growing visibility and recognition, Invisible College explores the aesthetics of a movement that has devised its own course; one that has been largely defined outside of institutional contexts. Moving away from the standard art education model that demands graduate school, an excess of critical rhetoric and an art world careerism, these artists, many of whom are self-taught, have sought their own inspiration and voice instead, drawing on everything from popular culture and social media platforms, to street art, murals and graffiti. By creating a distinct community in support of the diversity of its visions and styles, the movement has mortared and upheld its own invisible school. The New Contemporary movement, widely acknowledged to have begun in the early 90’s on the West Coast, evolved in reaction to a conceptual turn in fine art. Founded in part on a rejection of the arbitrary division of visual culture that tends to elevate “high art” above the social and popular realms, the movement invoked the countercultural and drew content from an immersion in social experience. The standard of excessive academicism and abstraction, against which it grew, was commonly held in higher regard than more figurative, graphic or representational forms of art. This marginalization inspired the New Contemporary movement to set its own terms and create its own context for the reception of its work. With a renewed emphasis on technical skill, narrative and representation, it has encouraged a social return in art. The Invisible College captures the energetic irreverence and variety that has continued to shape the movement and its spirit of self-determinism. The works included in this exhibition range from the illustrative and graphic, to the surreal and figurative, embodying in one way or another the populist sensibility that makes the movement so exciting, current and relatable. Invisible College offers a cross-section of some of the most exciting artists working in the New Contemporary genre. As it continues to evolve and expand, the movement embraces talent from all over the world and ushers in a new-guard that seeks to increase the social and popular relevance of contemporary art. Rather than limiting their work’s reception to art world initiates, these artists create pieces inspired by popular and street cultures, summoning the world back into art rather than championing its exclusion and remove. 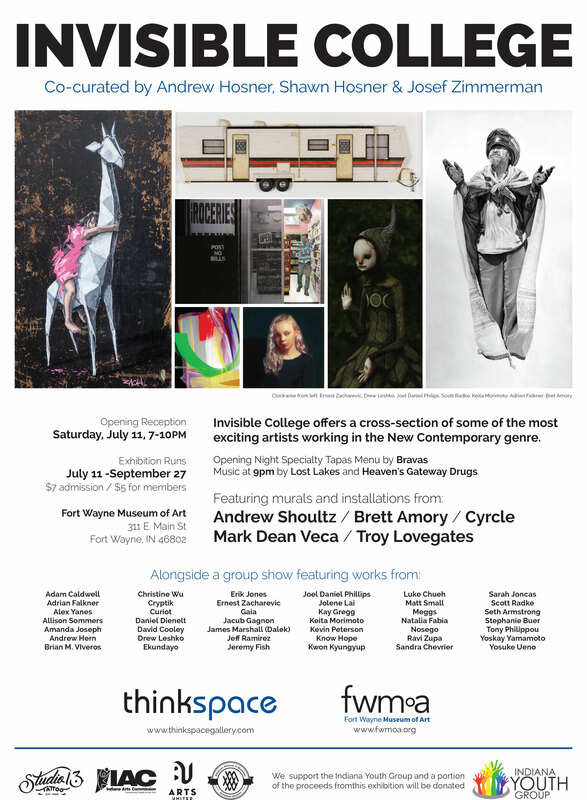 Invisible College will include works by Adam Caldwell, Adrian Falkner, Alex Yanes, Allison Sommers, Amanda Joseph, Andrew Hem, Anthony Clarkson, Brian M. Viveros, Christine Wu, Cryptik, Curiot, Daniel Dienelt, David Cooley, Drew Leshko, Ekundayo, Erik Jones, Ernest Zacharevic, Gaia, Jacub Gagnon, James Marshall (Dalek), Jeff Ramirez, Jeremy Fish, Joel Daniel Phillips, Jolene Lai, Kay Gregg, Keita Morimoto, Kevin Peterson, Know Hope, Kwon Kyungyup, Luke Chueh, Matt Small, Meggs, Natalia Fabia, Nosego, Ravi Zupa, Sandra Chevrier, Scott Radke, Seth Armstrong, Stephanie Buer, Tony Philippou, Troy Lovegates, Yoskay Yamamoto and Yosuke Ueno. Included in Invisible College are special mural installations by Andrew Schoultz, Cyrcle, Mark Dean Veca and Troy Lovegates. The exhibition will also include a featured installation by Brett Amory. Beginning with art classes in 1888 given by J. Ottis Adams and later William Forsyth, the Fort Wayne Museum of Art has evolved into a center for the visual arts community in Northeast Indiana. 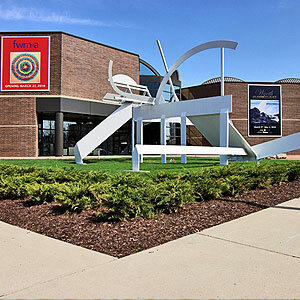 Regularly exhibiting regional and nationally acclaimed artists, the FWMoA also boasts an extensive permanent collection of American Art as well as prints and drawings from artists such as Jackson Pollock and Andy Warhol. The Museum is committed to the collection, preservation, presentation and interpretation of American and related art to engage broad and diverse audiences throughout the community and region, and add value to their lives. The Fort Wayne Museum of Art is a funded partner of Arts United of Greater Fort Wayne. Founded in 2005, Thinkspace gallery was established with a commitment to the promotion and dissemination of young and emerging art. The Culver City gallery is a catalyst for the emerging art scene in Los Angeles and beyond, and is dedicated to the exposure of its artists and the support of their tenets. This young movement, straddled between street art, graphic art, design and popular culture, is subject to steadily increasing international exposure and interest, and is in need of institutional advocates. Thinkspace is positioned to create opportunities and act as a visible platform for the New Contemporary movement, and its aim as a gallery is to establish both a curatorial forum and a collector base for its output. As an institution, Thinkspace is committed to vision, risk and the exceptional talents that wield it. From the streets to the gallery, from the “margins” to the white cube, Thinkspace is re-envisioning what it means to be “institutional”. As a haven for talent, and a venue founded in passion, conviction, and community, the gallery’s mandate is rooted in belief and support.